Riku has a new Keyblade in Kingdom Hearts 3. People have opinions about it. Let's see what they are! 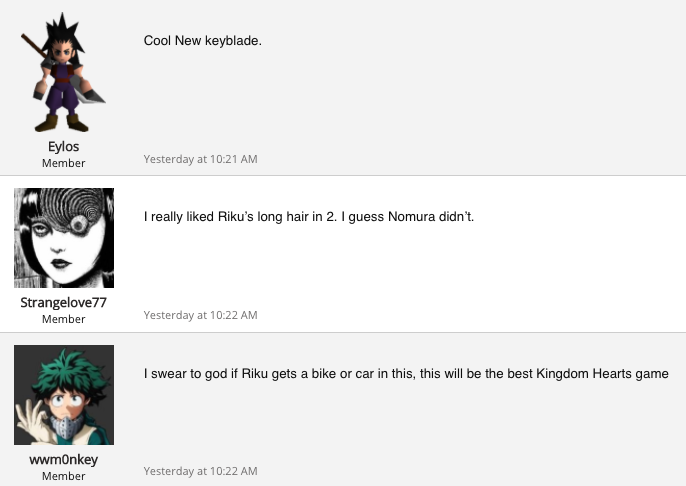 "Nomura-san, did you come up with a Keyblade design for Riku yet?" Kingdom Hearts 3 Riku figure! Why is everyone whining about Riku's new Keyblade looking like a car key when this Keyblade was in Kingdom Hearts 2 and no one said a word? 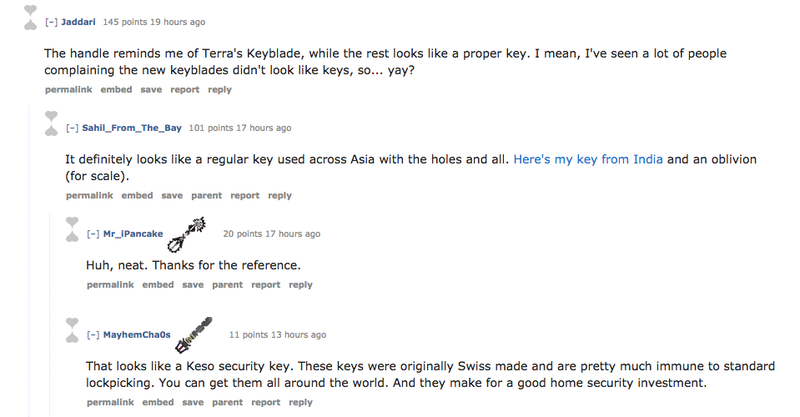 But seriously though, that Riku's new keyblade looks like FENRIR but something is telling it's actually not. Coming from the same guy responsible for the modern style in FFXV, doesn't surprise me in the slightest. Just needs some more belts and zippers. FFXV keyblade was my first guess, it was always gonna be a car key because a $100 sandwich doesn't make a food weapon and it can only be a choice between those two. Well, duh! It's called a 'KEY'blade for a reason! I dont see what draws people to these games. Horses for courses I geuss. They are decent games, and the first had a good story. The second game messed up that story and they released 93, 564 other games to try and explain it. TBH the ending boss fight in the second game put me off the series. upvoted for the rollercoaster of emotions. That is pretty much what happened. Liked the first game, the second game was a bit convoluted but it was still alright aside from the one section where you play as Riku in a boss fight even though you'd never ever controlled him before. Third game I played was Kingdom hearts number and a half days, cause screw comprehensible names, right? I lost the story in this game (the DS one), was confused as heck and actually got bored halfway through. I haven't played one since. I don't hate the games. 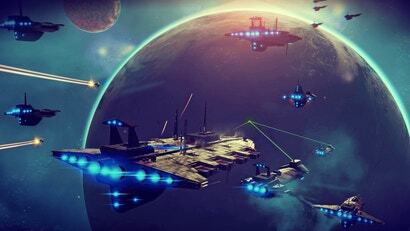 The gameplay is good, but, story is what generally keeps me coming back. I can't make sense of it so it's no longer for me. Birth By Sleep still has the convoluted stuff but it's by far the best the series has ever been gameplay-wise, at least until 3, maybe. TWEWY on the other hand <3 Where's the sequel for that? Didn't a port get announced for Switch recently? With it's inclusion in Kingdom Hearts too I wonder if Square has their eyes on it, even just remotely. They only did it to shut us fans up =P But the port has an epilogue and that's it. Yeah, the premise seems pretty ridiculous but people swear by this series. I've seen it suggested that I need to play the other games in the series (there are like 10 or something) in order to understand this one. That can't be right....can it? Don't bother. You'll play the other 10 games in the series and still not understand. It does seem to tie up a lot of the overall series but I honestly doubt that. There are 7 actual games not including all the remasters and only three are essential. 1, 2, Birth by Sleep are the central stories, Chains of Memories and 365/2 Days add to the story, but were never essential to understanding and Coded and Dream Drop Distance are filler. You can get everything you need from vids and plot synopsis. Chain of Memories I'd consider important to at least see the first sightings of the Org.13, plus it shows how Sora got from where he was in 1 to where he was in 2. Yes, as I said, it added to the story, but it wasn't essential for playing KH2 though, it fills in a few plot points and fleshes out others though. 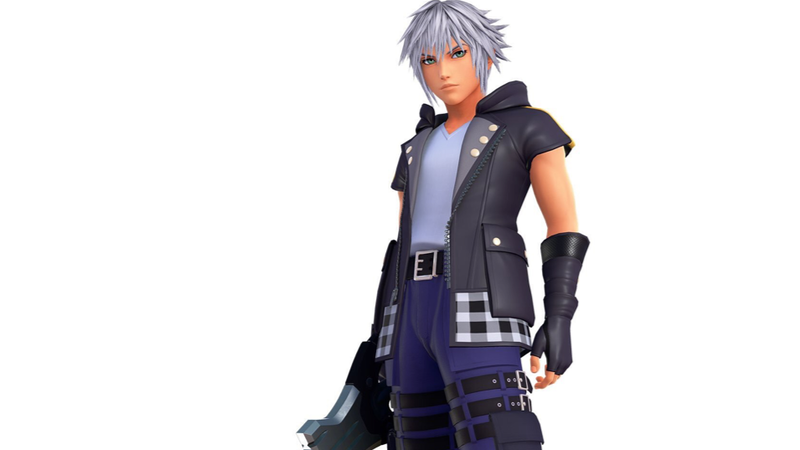 Where Sora was and what happened to Riku are stated in reports and mentioned in brief comments. I'm not saying that any of the games aren't important, only that you don't have to have played every game and it's remastered versions to know what's going on in the world, plenty of ways to get the information and I'm saying that while looking at the stack of KH games and their remasters on my shelf and the dusty gap where 3 will go lol. I should add that I'm very lucky it's my gfs all time fav franchise so even when I couldn't be bothered playing through all of the remasters on every system, she went in full tilt and I got to sit there and watch. I'm extremely excited for 3, it's been a long time coming.